You can use your eGift Card at Brinker International restaurants located in the US, Puerto Rico, Guam and internationally at restaurants located on US Military Bases. These restaurants include: Chili's� Grill & Bar, On The Border Mexican Grill & Cantina�, Maggiano's Little Italy� and Romano's Macaroni Grill�. Card may not be redeemed for cash, except as required by law. No service fees are charged in connection with this card. Issued by Brinker Services Corporation. For location information, visit www.Chilis.com. 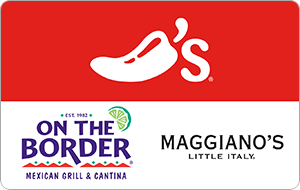 Brinker International and all of its affiliated brands, including Chili�s� Grill & Bar, Maggiano�s Little Italy�, On The Border Mexican Grill & Cantina�, and Romano�s Macaroni Grill� are not a sponsor or co-sponsor of this promotion and is not liable for any alleged or actual claims related to this offer. See back of card for terms and conditions. All brand names and logos are registered trademarks of their respective owners.